Whether you’re a CEO at one of the country’s largest investor-owned utilities or one of its smallest, you face many of the same market pressures. The same is true for executives at independent power companies, transcos, and system operators. But in each case those pressures carry different implications—and they call for different responses. To better understand how today’s driving forces are affecting companies in different situations, Fortnightly spoke with CEOs at American Electric Power, the California ISO, and El Paso Electric. AEP is one of the country’s largest utilities, with a heavy reliance on coal, and differing market structures, regulatory requirements, and resource considerations among the many states it serves. El Paso Electric serves a sizeable patch of non-ERCOT Texas and southeastern New Mexico, and depends on nuclear and natural gas, with a fast growing component of solar energy. And in California, the ISO is tasked with managing the transition to a green future, with the country’s most aggressive renewable portfolio standard—33 percent by 2020. Their comments suggest the industry’s future is bright, despite a shifting and uncertain landscape. Fortnightly What do you see as the most important issues affecting your company’s future, and how are those issues evolving? 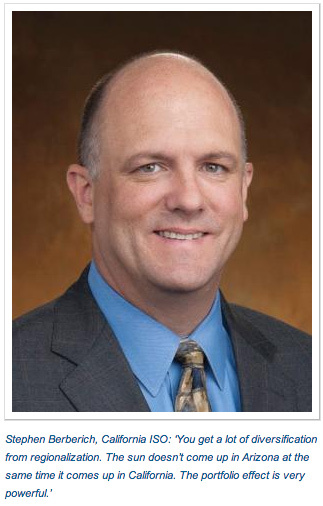 Nick Akins, AEP For our company and the industry in general, there are some major challenges. One is obviously how we deal with capital deployment, particularly given the denominator of kilowatt-hours of sales that are stagnant or maybe even decreasing in the future. That drives us to focus on optimizing [our operations], versus determining where the next central generating station will get built. We have to change our view of what resources are available—not just central generation but also distributed generation (DG). The industry needs to be cognizant of new technologies that are evolving. And in our industry’s history there’s never been a greater need to focus on customers’ expectations, and on their changing energy use patterns. We’re focusing on T&D infrastructure development. To reinforce the existing infrastructure and [accommodate] resources for the future, you’re talking about $2 trillion that’s needed over the next two decades. And utility companies today are BBB credit quality versus A- and AA-rated 20 or 30 years ago. That drives a different financial structure. AEP is focused on separating out our generation. Our model is moving toward a competitive environment. I’m not sure about that [trend]; it’s gone back and forth based on conditions in the industry. But we need to be able to function in both environments. That means our organization needs to change to more of an entrepreneurial culture going forward, versus the regulated model. That has to change for us. We’re very focused on the cultural shift within AEP to address the needs of the future, to address resource optimization, and focus on areas of growth with discipline. Our culture needs to focus on activities that make sure the customer experience is positive. It’s amazing to me to see the amount of change that’s occurring, and how quickly it’s occurring. When I started my career 31 years ago, it was just about determining where the next central generating station would be built to meet growing demand. Now, consumers’ needs are changing, resources are changing, not just generation but also transmission and smart grid applications associated with efficiency and management of consumption. Those areas are a challenge for our industry as we plan for the future. What part of that future are we as a business going to be involved with? We will be involved with technologies as they change. Will we continue with a no-regrets type of infrastructure development that’s conducive to what the future holds? Those are key questions we need to focus on answering. We’re discussing with customers and regulators what their preferences are. That’s the best chance of getting recovery for the investments we’re making, and the allocation [of resources] between generation, transmission, and distribution. When you have a line of sight to what your customers and regulators want, you can address the ratemaking issues. What will we do if load continues to be stagnant? We have to make choices. In Kentucky, at the Big Sandy coal plant, Clean Air regulations would require us to put a scrubber on an 800-MW coal unit. It was a choice between a 30-percent increase in rates to customers, which our industrial customers certainly had concerns about, versus retiring that generation and putting new resources in place, which could mean repowering with natural gas—a resource that wasn’t available before. Those kinds of decisions have to be made from a ratemaking, cost-recovery, and financing perspective. We need special riders to address certain issues—recovery for construction work in progress (CWIP), for example, and other rate formulas that reduce the effect on customers. 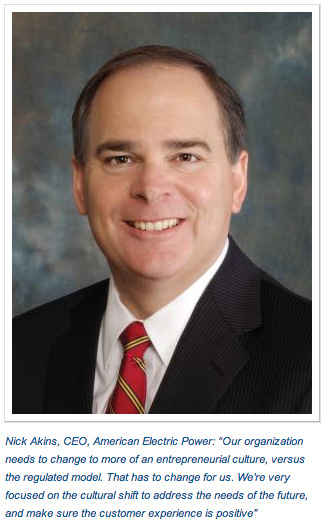 Fortnightly What’s your view on the expanding role of natural gas as a power fuel? Akins At AEP we believe strongly in a balanced energy portfolio that includes everything. You can’t go all the way to a specific resource without having a dramatic effect on what customers pay, and the reliability of the grid, and everything else. We’ve been heavily bent toward coal for 106 years. We see our coal footprint waning. It’s moving back from 65 percent to less than 50 percent coal by 2020. We see natural gas moving up, and we’ve already started the process with fuel contracting and generation available to go back and forth between resources, depending on coal and gas prices. It’s an advantage to have that type of diversity. We’re doing windpower contracts and other renewable energy contracts. But it’s really natural gas that will be the primary driver as we go forward, in terms of development. We put in 5,000 MW of natural gas facilities in the last five years. Last year the capacity factors went up dramatically for our natural gas units, because we have the gas contracting capacity. And we’re also the second largest inland barge carrier, so we have the capacity to bring in coal. When gas prices go up to $5.25 per MMBtu for example, that’s when coal will slide back in and get fully utilized. 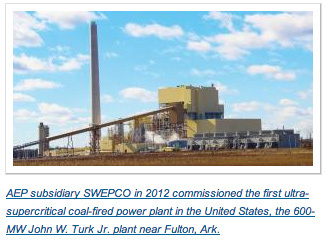 Last year we had coal-to-gas switching, and this year we have gas-to-coal switching. If you have a balanced, diverse supply, you can achieve that for customers. But if you go all the way to gas—well, the quickest way to $8 gas is for everyone to buy $4 and $5 gas. That can happen, so you need to temper your movement toward gas. The AEP service territory is well positioned to take advantage of the shale gas play, because many of those opportunities are within our territory. The Utica, Haynesville, Fayetteville, and Marcellus shale formations are all within our footprint. So we have the ability to look at resources in a different way. The other factor is transmission. AEP has the largest transmission system in the country. We’re continuing to advance transmission around further optimization of resources. We have some very unique characteristics, but at the same time we have opportunities to develop a very vibrant resource mix. Fortnightly When we last spoke (see “Battle Lines: Generators fight back against EPA regulations,” November 2011), AEP was concerned about EPA’s pending Clean Air regulations, such as Utility MACT. Since the 2012 elections many questions about the rules seem to have been resolved. How do the rules now affect plans for AEP’s generating fleet? Akins We were thinking we’d have to spend $6 to $8 billion on retrofits for our existing generating plants. But EPA listened to a couple of the things we talked about with regard to the MACT rule, and that reduced our estimate to $6 to $7 billion. Also we find that now we’re able to use dry sorbent injection instead of full scrubbers in some areas, and that will further alleviate the cost. And we’ll be replacing some coal units with gas-fired generation. So now we’re looking at spending $4 to $5 billion. We continue to optimize technologies, and we’re making adjustments to our plans for specific generators. At Big Sandy and other units, we made decisions to retire instead of making investment, because when you take the low price of natural gas and the capital cost of new gas-fired generation, it compares favorably with some of the equipment that you’d install to keep coal units running. For those fully controlled units that survive, they’re very efficient, larger units. We made the argument that we have to look at the reliability of the grid. Early on we said there were issues with reliability in specific localized areas, and that’s been shown to be true. EPA and others have had a lot of discussions about how quickly the rules would affect some areas, and that’s helped in terms of working through processes to protect the reliability of the grid. Also there’s been a slightly more moderate approach at EPA. Congress is discussing the confirmation of Gina McCarthy as the new EPA administrator. Our discussions have indicated she’s an aggressive person, but she’s reasonable, and we’re hopeful that EPA will continue to see that there are areas where we can work together to achieve advances. So far this industry is already on track to nearly achieve the greenhouse gas (GHG) limitation that was proposed in the Waxman-Markey legislation several years ago. That bill would’ve required a 17-percent reduction in GHG emissions by 2020, but because of natural gas, the economy, and efforts of utilities, we’ll achieve a 16-percent GHG reduction by 2020. We continue to see technical advances happening, and that’s all we need—along with the ability to work on the timing of rules being imposed, to make sure they’re reasonable. I’m hopeful that we’ll end up with an EPA that focuses on reaching out and understanding the issues. Previously, I don’t think there was an appreciation of how tightly connected our grid is, with constraints in certain areas, and how the timing of implementation would affect reliability. With processes that include everyone who is responsible for ensuring that, from state regulators to FERC, NERC, and the RTOs, we’re able to make progress. Fortnightly AEP recently announced plans to separate some of its generation resources. What’s behind that decision? Akins It was predicated by the state of Ohio moving toward deregulation. They had a deregulation bill in place for 10 years or so, but they didn’t want AEP to go into an unregulated environment because our prices were lower than those in deregulated areas. In the last year or two, with a governor and a new commission focused on moving toward competition, we’ve moved in that direction as well. It’s about being responsible to the areas where we do business. So we’re going through the process of corporate separation of our generation, at least the Ohio portion, to an unregulated subsidiary. AEP remains a regulated utility, and that’s what we want to be. Our intention of moving our generation to an unregulated affiliate wasn’t a preference, but something we’re doing as a result of the Ohio requirements. And we’re going to make the most of it. We’re very focused on our wholesale trading shop that does business with municipal and cooperative customers for long-term contracts. And with our retail organization, BlueStar Energy, we’ll focus on marketing to customers in various jurisdictions. It’s not meant to be a national retail player, but one that participates in those parts of the country where we can market our unregulated generation. As a regulated utility company, we intend to have our unregulated generation as hedged as possible, and looking quasi-regulated, with FERC-based contracts, retail contracts, or participating in auctions. That’s the direction we’re going. Our corporate separation has enabled us to delink our Eastern pool. It was a convolution of resources that met our customers’ needs in an entire region, but it also took away our line of sight to the different needs of different states. They were saying ‘Do we want to move toward energy efficiency, or develop coal, or new natural gas resources?’ Those are different preferences, and our operating model needs to be cognizant of that. As technology is changing in the meantime, our unregulated generation business can be used as a platform for advancement of technology based on customer preferences. We’re learning a lot, and it could change the way we do business in the future. We’re enthusiastic about the possibilities. Fortnightly Earlier you mentioned distributed generation. What’s your view on the growth of DG, demand response, and other distributed resources? Akins In our service territory we’re generally a low-cost provider. We haven’t seen the amount of DG here that some other areas have seen, like the Northeast and California. Our rates are less than half what theirs are. That gives us time to think about the future. I don’t think you can stick your head in the sand. Over time there will be more dependence on DG, and that will change the way we operate our grid. You have to think about it in terms of planning the grid and what businesses you want to be involved with in the future. That’s something our company is focused on at this point—developing a strategy for the future. Yes, it’s a challenge, but it’s a distinct opportunity. We need to be in a position to take advantage of that opportunity. From a microgrid perspective, it’s centered around community energy storage. We’re very focused on battery technology. We were one of the first utilities to look at large-scale storage, with sodium-sulfide batteries. And through our smart grid energy storage pilot, we looked at lithium batteries for neighborhood support. There are some supply-chain issues we need to address, but we continue to advance on those fronts. We keep seeing the cycle of battery advancement changing, with more frequent advances. As we progress, we’ll be looking at solar technology to advance it, and of course the efficiency of the grid itself. Through our smart grid pilot, we looked very closely at integrated volt-VAR control technology to address power efficiency. It’s a matter of fully understanding the scale at which you can put these projects in place, and capturing the benefits—and how you can pay for them. We have a 106-year history of being first in several areas. We just put in the first ultra-supercritical coal-fired power plant. We have a patent pending for a new type of transmission line. We’re putting venture capital into various technologies, as a window to see where they’re going. I’m very focused on that, and it’s something our industry as a whole needs to be focused on as we devise our path into the future. 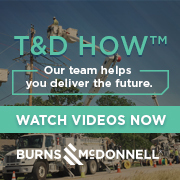 We’ve moved from the last few years from being a company that focuses mainly on generation—and deployment of capital on generation—to a company that’s more focused on development of infrastructure, including transmission and technologies that continue to advance the customer experience. That’s a transition that AEP is very focused on making. Fortnightly What do you see as the most important issues affecting El Paso Electric’s future, and how are those issues evolving? 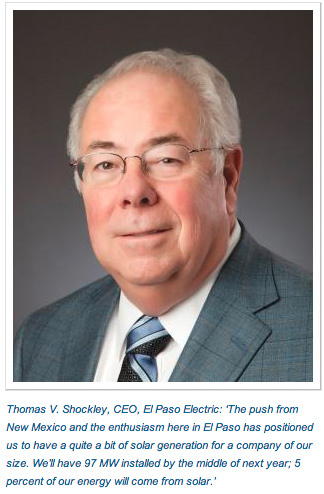 Tom Shockley, El Paso Electric We’re a very traditional, legacy utility company. We make electricity, transmit electricity, and distribute it to our customers. We bill our customers based on a traditionally regulated environment. We’re different from utilities in a whole lot of areas, and that drives a completely different type of vision about where your risk might be, and the way you go about getting recovery of costs. We live in an area that takes pride in being known as “The Sun City.” We’ve got a lot of sun, and as a result solar is the most popular form of renewable energy. In fact it’s about the only renewable resource in the area we serve that’s gotten any traction. Obviously there are areas in Texas and New Mexico where the wind has been prominent as a renewable resource, but in our area solar has received the most attention. In New Mexico they’ve had some aggressive state legislation that has promoted the growth of renewables fairly aggressively, and so our area in southern New Mexico has over the last two to three years aggressively added solar resources. We now have 47 MW in four different installations in southern New Mexico, and we signed a contract for 50 MW more that should be online by May of next year. So the push from New Mexico and the enthusiasm here in El Paso has positioned us to have a quite a bit of solar generation for a company of our size. We’ll have 97 MW of installed capacity by the middle of next year, and our total installed generation is about 1,800 MW. 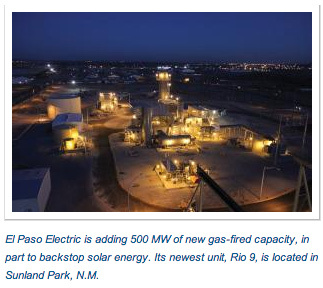 So within a year, 5 percent of our energy will come from solar plants in New Mexico. We have a renewable energy requirement that ramps up to 20 percent by 2020, and we’re staying ahead of the requirement. Fortnightly I understand EPE relies on nuclear power for a large share of its baseload supply. How do you plan to manage the variability of solar generation on your system? Shockley About 45 percent of our capacity is from the Palo Verde nuclear plant, and clearly that’s base-loaded virtually all of the time. But all of the generation we own in the El Paso and southern New Mexico service territory is natural gas-fired. We have a challenge with peak loads versus minimum loads, and what to run and what not to run. Our operators have been doing it for a number of years, and they’re very good at it. We can cycle the units we need, and we have a capacity expansion plan that will give us more flexibility to respond to renewables coming onto our system, especially solar. We operate aeroderivative gas turbines that can start and reach full output in about 10 minutes, and then they can come down quickly as we come off peak. Obviously solar is only available during the day. Fortunately for us, our load is higher during the day than it is in the evening. It’s not a perfect match; we have a late-peaking load, and our solar generation starts up early in the morning and on a clear day stays fairly stable until late in the afternoon. Some days you have clouds come over and you don’t get the output you do on other days. We’ve shaped our generation expansion plan to give us just under 500 MW of fast-ramping capacity that will help us to manage that situation. We just finished one unit this spring, and we have additional units scheduled for late 2013, and in 2014, 2016, and 2017. We also have a very small amount of jointly owned coal, at the Four Corners station in northwestern New Mexico. That’s only about 107 MW [of a 2,040-MW plant]. In the Southwest, the implementation of new EPA rules is having a dramatic effect on coal usage. Coal plants are being retired as part of efforts to meet total emission requirements. We’re going to see a lot of generation retired that might not be totally depreciated, and we’ll see a lot of costs to replace that generation, probably with gas-fired plants. With EPA rules now, I think it’s impossible to get a permit [for a new plant] to burn anything but natural gas, because coal can’t meet the greenhouse gas requirements. Those of us in a regulated legacy environment always worry about fair treatment as you try to recover your costs. Also we have rate-lag issues when you finish large construction projects. The old challenges are the ones we still worry about, and the new environmental issues are unfolding. We’re fortunate to have such a small sliver of our generation from coal, so the effect on us will be fairly small. Our partners are now in negotiation for fuel supply and are considering extending the life of the Four Corners plant. As we get it sorted out, El Paso Electric would like to exit our portion of the plant. Fortnightly What’s your view on the expanding role of natural gas as a power fuel? Are you concerned about over-reliance on gas as it serves an even larger share of your load? Shockley I don’t have concerns about that. I follow a lot of the literature about what’s happening in our technical capabilities for extracting energy from shale, and it seems like it’s virtually every place in the U.S. Having said that, I am 68 years old and my first job was in a fuel department in the ’70s. We had firm contracts for 25 cents and within a year it went to over $2 and became regulated at the federal level. We realized then that fuel diversity was the best way to go. I remember that very well, but it seems to me that we have a very sustainable period of time with gas—maybe not as cheap as it was a year and a half ago, but at a reasonable level. And when the price goes up it will promote additional development. Fortnightly As a vertically integrated company that operates in the Western Interconnection, and not in an RTO or ISO, what’s your perspective on the direction FERC has been taking with new rules like Order 1000? Shockley The Western Interconnection is under the same regulations, but it’s perhaps not affected as intently as some places in the East for example. It certainly is a noble effort to create fairness in the marketplace, and we all will try to support that to the extent we can. But the complexity of having a competitive wholesale market and a non-competitive retail market can be very complex, with regard to the way you operate the transmission system. Internally, certain employees can’t talk to other employees. It gets bizarre, the rules you must have in place to make sure you uphold the principle of making the wholesale transmission system something that’s there for everyone who wants to use it. It’s something we’ve had to learn, to apply the rules correctly. Working with different customers and generators, and providing access for point-to-point sales, is something to stay focused on to make sure we abide by the rules and intentions of FERC creating an open market. Fortnightly El Paso Electric recently cut the ribbon on a new microgrid at Fort Bliss. What’s your view of prospects for microgrids and other distributed energy resources, and their effect on the industry? As the Sun City, El Paso might see the consequences of distributed solar sooner than other locations. Shockley There’s an issue of semantics here. I’m not sure that if you said “microgrid” to 10 different utility folks they’d all have the same thought in their minds. With regard to Bliss, they’re trying to move the base to a net-zero requirement. I think the perception is it’s a way to operate in an emergency, but not a long-term solution. I can’t ever see that it would make any sense at all to lose the reliability of a larger grid in normal, non-hazardous times and put a microgrid in place of that. In a state of emergency, having the ability to isolate part of your load and serve it with distributed resources in an island mode could make sense. One thing that people aren’t aware of is that for the vast majority of the solar installations that go in, they’ll only operate with a live grid. If they were isolated, they couldn’t continue to contribute power unless they were specially ordered that way, and that has an impact on cost and configuration. Fortnightly Do you have a net-metering provision in your service territory? Shockley Yes, we have net metering based on the monthly bill. Texas doesn’t, statewide, but the four legacy utilities in the state have an opportunity to implement rules specific to our area. One rule that we implemented two years ago to support DG—solar primarily—was net metering on a monthly basis. We meter in and out, and if they give us more than we give them, we pay for the excess at avoided cost. Short of that we give back everything they gave to us to offset the bill we charge them. It isn’t a problem for us right now with the amount of rooftop solar that we have. From a philosophical ratemaking perspective it could grow to be a problem. Recently I read that the San Antonio municipal utility decided it’s getting to the point that it’s pushing too much of the distribution cost burden onto folks that don’t have rooftop solar. [At press time CPS Energy announced it would delay by one year its plan to replace its net metering program with a new tariff that provides about half the price for rooftop solar generation.–MTB] As we look at the effect on our total customer base, we have to be sensitive to those who want solar and also those who don’t want it or don’t have the means to get it. If it gets to the point where it’s unfair, we’ll have to look at it. Fortnightly What do you see as the most important issues affecting the future for the California Independent System Operator (CAISO), and how are those issues evolving? Stephen Berberich, CAISO Clearly the biggest challenge or agenda is bringing renewables onto the system as reliably and cost effectively as we can. We’re looking for ways we can actually leverage them up. Spain uses a 1-for-1 backup strategy: 1 MW of traditional generation for every megawatt of renewable generation. That’s not a very cost-effective approach. We’re looking at creating a very flexible fleet so you can leverage up far more renewables. Modernizing the fleet is the most important thing for leveraging more renewables. Some renewables can help too. You want the backup fleet to start, stop, and ramp up quickly, and to produce the lowest PM (particulate matter) emissions possible [in spinning reserve]. That’s important. You don’t want an over-generation situation, so you need flexible plants. The other thing is you get a lot of diversification from regionalization. The sun doesn’t come up in Arizona at the same time it comes up in California. So the portfolio effect is very powerful. Having a regional portfolio is something we’re working to advance. 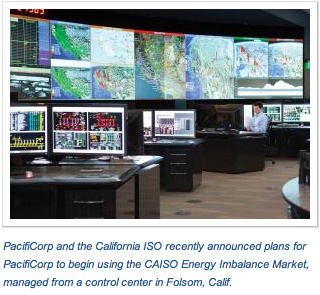 Fortnightly PacifiCorp and CAISO recently announced plans for PacifiCorp to begin using the CAISO Energy Imbalance Market (EIM). But PacifiCorp won’t actually become a CAISO member, and it will retain control of its assets. How will that work? What’s behind this move? And what does it mean for the future CAISO footprint? Berberich Outside of California, much of the generation in the West is scheduled on an hourly basis. That doesn’t work very well for renewables. We have the ability to dispatch every five minutes. That’s a powerful tool for integrating resources. PacifiCorp sees that—with more efficient dispatch in their footprint, and also with optimized California assets, we’ll get multiple bangs for the buck. PacifiCorp will be acting as a buyer and seller, but won’t be bringing its transmission assets into the grid. There are benefits of optimized transmission assets too. Consolidating balancing authorities in the West seems inevitable. I’m not sure of the exact number right now—37 or 38 balancing authorities. That’s just not a tenable situation, given the higher level of renewable resources. What you’re seeing is the world is moving toward more renewables, and it’s just too difficult to comply when you’re operating a small balancing authority. Inevitably there will be consolidation. PacifiCorp sees that, but decided to take the initial steps of using the market platform for a number of reasons. It’s a good way to start. The EIM will go forward on two tracks. The first is an implementation track, making sure we’ve done everything we need to do in our system. Largely it’s around modeling. Critical to five-minute dispatch is to model the system, optimize it, and build the PacifiCorp model into our system. The other track is a stakeholder process, designing how the EIM will work to meet PacifiCorp’s needs while not precluding others from joining the EIM as well. It will come together with a FERC tariff filing for the EIM. We hope FERC will act on that and we anticipate implementation in the fall of next year. Berberich California has led the nation on the use of natural gas. We’ve phased out almost all coal-fired capacity in the California system for some time now. LADWP has some coal, but it’s not in our footprint. I’m aware of the commodity risk issue associated with reliance on a single fuel. It’s clean and it seems increasingly abundant, but you must have a portfolio of resources to reduce the single-fuel risk. I think in the future that risk will become greater here in California and across the nation. We have to look at the supply side of the equation—the natural gas system—and make sure it’s robust, resilient, and secure—and that it’s designed and planned to meet the long-term needs of the power system. As you ramp gas-fired generation up and down, you put stress on pipelines, and that could become an issue. We’re working closely with gas companies. We’ve given them our scenarios for the electric system through 2020, and they’re looking at possible issues with pipelines—particularly for PG&E. Also the Western Electric Industry Group is working on a study of gas supply. Fortnightly Distributed energy resources—notably rooftop PV, demand response, and microgrids—are beginning to have a disruptive effect in some utility territories and power markets, most notably California. What’s your view of distributed energy resources and their effect on the industry? Berberich Should we be concerned about DG? I wouldn’t say ‘concerned’? I think it’s the march of technology, and we ought to embrace technology. If that means some current business models no longer exist, then that’s what it means. AT&T’s landline business dried up and was replaced by cell phones. Look at what Amazon did to Borders. That’s the march of technology. It’s a classic disintermediation cycle. I think utilities have to embrace that, because there’s not a lot they can do about it—like bookstores and the old AT&T. I think DG is the future. The only question is ‘When is it coming?’ I don’t think it’s advanced enough now largely because there isn’t a storage component to it. But if you get a cheap storage solution matched up with DG—game over. You’ll see microgrids come up. What does that mean for utilities? They have to reevaluate their business models. This technology is coming, and utilities need to play a role. They need to find a way to bill for their services. Volumetric billing won’t work under a DG model. California will be one of the first places to see DG take off. We see rooftop solar growing at 3 percent a month in San Diego—an amazing growth rate, a phenomenal thing. I see the world developing in three phases through 2050. Now we’re in phase 1. Conventional backup generation, mostly gas fired, has to be there, and we have to continue enhancing it and modernizing the grid. Then through 2030, we’ll continue to see prices decline for DG. We’ll see a storage breakthrough by then, and DG will take off. We’ll need to continue the backstop utility network. But as you march to 2050, in phase 3, you’ll see less need for the utility backstop. The question really is timing. Is it 2050, or 2090? I don’t know. If the ISO isn’t needed anymore, so be it. We must not stand in the way of technology. The ISO should be in a position of facilitating the technology to the extent we can. On the other hand, the grid will become more complicated with microgrids and [self-healing smart grid] technology. Keeping that all together might be a role for ISOs in the future. The whole DG convergence is an important one. I think utilities are slow to recognize the trend. The cost of utility power will continue to go up, labor expenses will go up, and the need to invest in distribution systems will go up. Everything points to upward pressure on utility rates. And everything points to declining prices on DG and storage. As those trends continue their march, the system will change, and utilities will have to think through how they bill for their product, and the role that they’ll take.